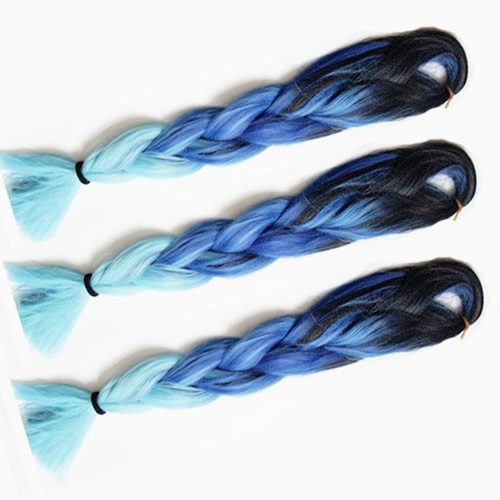 If you're favourite colour is blue, then blue hair extensions might just be the hair extensions you've been looking for. Blue is a very versatile colour and comes in a wide spectrum of shades and hues and so there's a blue for every skin tone - it's safe to say that tone is everything, and as long as you can find the right tone of blue - you'll look great. You'll find that with hair extensions, it's easier to find the on-going trend of dark roots, whether as a T-colour, dip-dye or ombre look. If you're lighter in complexion or pale, the lightest shades of blue will work well with your skin tone without washing out your complexion and if you're aiming for subtle or super chic looks then head to the darker shades of blue including ombre effects - be aware that ink-blue colours may make you appear ever paler due to the contrast in skin tone with the depth of the blue hue - be aware but don't be put off. If you have a darker complexion then perhaps the lightest shades of blue might be too dramatic (although they'll still complement your skin tone). If a striking look is what you seek then any shade of blue will suit and if you're trying to go for a subtle look then the darker blues work well. If you want to walk into a room and "own it" as they say stateside, then blues that veer into turquoise will certainly do it. If you’re going to wear blue hair and you're not planning on looking like you're wearing a costume, then it’s better to avoid wearing blue clothes at the same time. Yellow (gold or brass colour) tends to work better with darker shades of blue as it can clash with lighter shades of blue. Silver jewellery works well with lighter or darker shades of blues. Accessories such as belts can be in any colour as they're far enough away from blue colour of the hair extensions so that they won't clash and can even enhance or accentuate the particular shade of your blue hair extensions. Blue tends not to clash with other colours (and yes, the rhyme about "blue and green must never be seen" is completely fictional - people simply say it when they don't like a mix of colours such as yellow and green or red and green or green and green!). If you want to down play the colour of your blue hair extensions, then on the top part of your body, wear clothing that that matches the temperature of the blue hair (so if you have pastel blue hair, then wearing paler coloured shirts, blouses etc. will lessen the impact of your light blue coloured hair; equally darker coloured tops will mute the colour of dark blue hair). An easy rule to follow is that the darker the blue hair, the more subtle the look and the lighter the more statement-making the look. If you're at a loss as to what length would suit you, then why not check out our hair extension lengths by face shapes guide for the lengths that suit different faces, but the best thing to think about when choosing the length of your blue hair extensions is to think about the shade of the blue and whether it's a solid colour or dip-dye look - as your look will be dictated by what colour hair is framing your face. If it’s a bright blue then go for shorter for a sharp look. 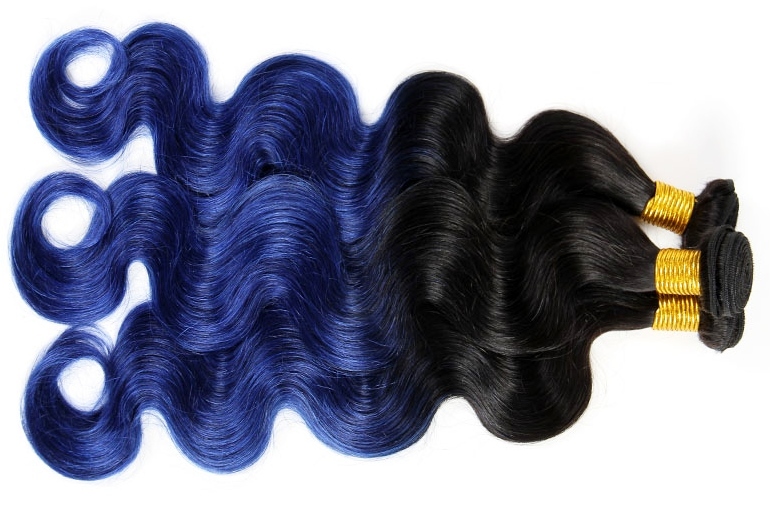 If you want more length for your bright blue extensions, try an ombre or dip-dye look. 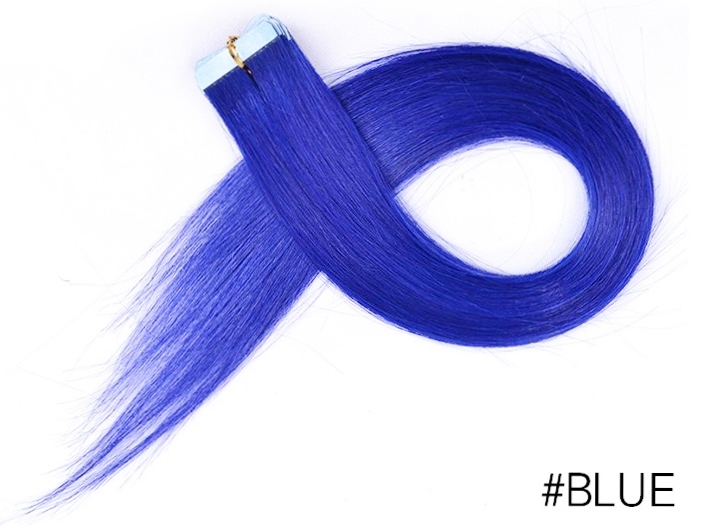 If it’s a dark shade of blue then shorter or longer lengths won’t seem overly dramatic. If you have human hair then you’ll need to deep condition with a conditioner specifically for coloured hair to ensure the colour doesn’t fade. It’s also important to remember that human hair extensions that have already been processed for colour shouldn’t really be dyed again as it’ll shorten the lifespan of the hair. Synthetic hair extensions can be washed with a mild shampoo as normal. So there it is! Proof that anyone can wear blue hair extensions as long as the colour complements skin tone (whatever the length). Now you can bounce through your front door and your blue hair will turn others green with envy! Join our blog to be the first to know about our next article.